Take the guesswork out of your conversion wiring. We offer plug and play conversion and stand alone wiring harnesses for 3.4 swaps, 2rz/3rz’s and more. Simplify your swap’s wiring with one of our plug and play conversion harnesses. 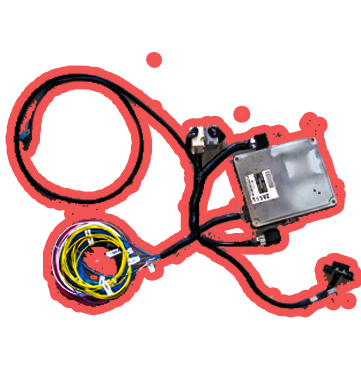 Our harness adapts all your vehicles original wiring to your new engines computer/ECM and engine wiring harness, mating both systems together to function like factory. With so many changes in wiring and limited interchange between years and models we are unable to stock harnesses and each one is taylor made to your swaps particular needs. To save our customers money we give you the option to send us your donor plugs from both vehicles. Or pay the core charge and send your plugs in after the swap for a refund. If you do not see what your looking for below contact us for a quote for your particular swap. Take a look at the bottom of this page for our custom order/quote form and donor plug info. Before you source your engine contact us first to make sure how compatible it is with your swap. We do not work with JDM wiring. Orders completed in 2 to 4 weeks depending on current order volume. We do not make complete engine harnesses, we do not supply ECU’s. Below are our most popular conversion harnesses for easy buy it now shopping. To start the process ship us your Donor plugs from both vehicles. “see donor plug info below” Make sure to include your contact info, phone#, email, and return shipping address, along with the details on your swap. Once we receive your donor plugs we put your order in line and will be completed in 2-3 weeks in most cases. Once your conversion harness is completed we will contact you for Credit card or Pay Pal payment. We accept checks or money orders as well, send checks or money orders in with your donor plugs to speed up the process. From the original vehicle receiving the swap we will need the engine harness, or a certain section of it if you’d rather not send in the complete harness. Often this is your 3.0 or 22re engine harness. We can in most cases supply these plugs for you at a cost of $75. You can pay the donor plug fee up front and send in your donor plugs after the swap for a full refund. Donor plugs from vehicle your conversion engine is out of. OBD2 plug/port , from under dash harness. We must Identify your swaps computer and engine harness part numbers, the Vin number is the best way. If you don’t have the Vin number then we need part numbers off on your engine computer “ECU/ECM” there should be a sticker on your ecu part number should start out 89661-????? or 89666-????? See example photo.